Proffesor Anthony (Tony) Rippon is a man, who in his own words “wears a couple of hats”, one being an ambassador for the Dim-Dep Enviro Blitz aimed at highlighting environmental matters through “edutainment”. Dim-Dep: Faces of Environmental Success is an ongoing interactive and creative theatre production. “My role involves promoting legends, those special people that are role models in arts and culture and pro-active in environmental issues,” Rippon said. His described his friendship and collaboration with Atlas Duma, the founder, author and director of Dim-Dep, as a meeting of minds. “We share a passion for the arts and both are hoping to achieve a shift towards people understanding the importance of looking after the environment,” Rippon said. His participation in Dim-Dep happened by chance when in July 2015 he saw a production of Dim-Dep at a small venue at the Play House in Durban. “I was attracted to it as I both music and the environment is close to my heart and in the back of my mind I saw the potential for a ‘life case study’. At the time I was a full time academic and working on the development of an environmental module,” said Rippon. He arranged to meet Duma and the two men immediately recognised how much they had in common. “During that first conversation we realized we shared a passion as musicians and using entertainment as an educational tool. 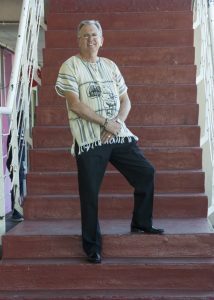 I became involved in Dim-Dep and it ended up as being an awesome experience with the cast growing from about seven to more than 60 and moving to the Opera Theatre at the Play House,” said Rippon. Rippon’s first role was as an advisor, but he ended up with a small part in the musical as well as composing and writing a song Too Blind to See that was used in the finale. Rippon also act as a strategic advisor for the Sagiya Foundation – a performing arts, theatre and musical enterprise production, also founded by Duma. Rippon (60) was born in Pietermaritzburg, Kwazulu-Natal and after working for several years in the transport, environmental and tourism industry, he studied further and completed several degrees at the University of Johannesburg (UJ). He received several accolades including a Legends Award in 2016. He is married to Aneza and has two grown up daughters, Alechia and Marique. Now based in Pennington on the KZN South Coast he is also involved in academic work, lecturing, coaching, mentoring, facilitating motivational speaking and consulting. However, his 1st passion is being a musician and promoting the importance of arts and culture’s role in education followed, or rather equaled, by his love and consideration of the environment. “I believe in edu-entertainment. It is different, inspirational, motivational and healing,” said Rippon.